Our lab and the lab of Hyejung Won (wonlab.org) acquired a grant from the Simons Foundation to identify common genetic variants associated with risk for autism. Our shared postdoc Nana Matoba is working on this project. Thanks to the Simons Foundation for their support and we hope to add to the list of common genetic variants creating risk for autism. Dan Liang was selected to give a talk on the genetic influences of chromatin accessibility during human neuronal differentiation at the UNC genetics retreat in Wilmington, and won the best student talk of the Bioinformatics and Computational Biology program. Congrats Dan! Mike Lafferty presented a poster on miRNAs involved in human neurogenesis and won a best student poster award for the Bioinformatics and Computational Biology program. Congrats Mike! We are moving on March 19th, along with the UNC Neuroscience Center, to the newly renovated, window filled, Mary Ellen Jones Building! Looks really beautiful and will be a great place to do some genetics and brain science. Congratulations to Tianyi Liu, who joined our lab in 2017 and just was admitted to the UNC Biostatistics PhD program. Also, congratulations to Leo Zsembik, the first undergraduate in the Stein lab, who was just admitted to the Oxford Neuroscience Master’s program. We wish you both best of luck in your next scientific adventures! 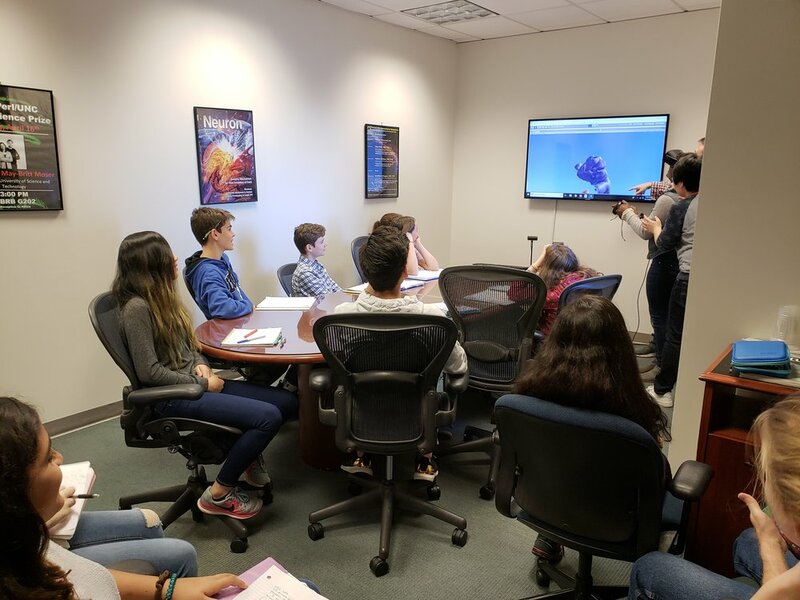 Today we taught some middle school students about how genetics shapes the brain, and let them explore a human brain in virtual reality. The Stein lab co-organized the Andrew S. Rachlin UNC Neuroscience Symposium this year. Thanks to Dan Geschwind and Flora Vaccarino for coming as our keynote speakers, and to all the local speakers for a fascinating seminar! Hope it leads to future collaborations and projects on tackling neuropsychiatric disorder genetics here in the triangle area. Congratulations to PhD candidate Rose Glass for receiving a T32 Neuroscience Curriculum Training Grant through UNC! 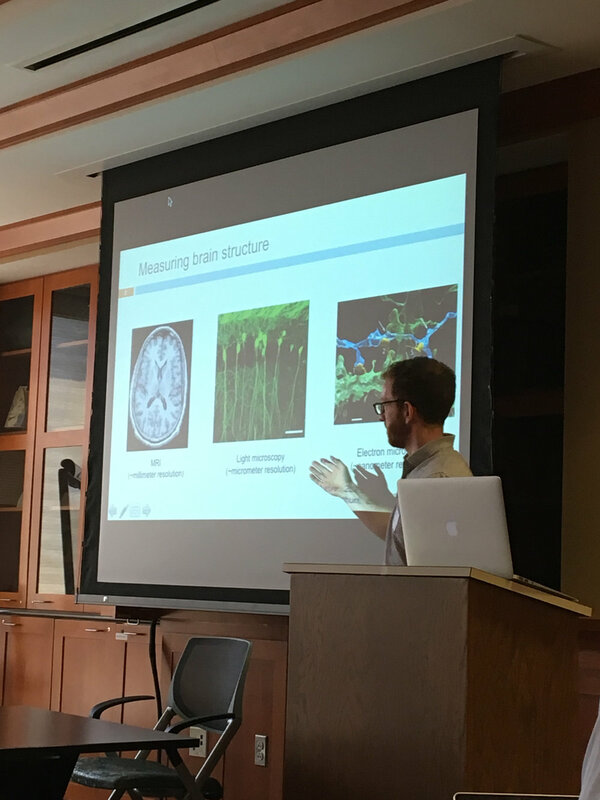 Stein Lab and our collaborator Dr. Guorong Wu were invited to speak at the UNC ARVR Interest Group Meeting to demo our work with mapping a mouse brain in 3D and visualizing human brain networks using virtual reality. "Come and join us for a talk by Dr. Jason Stein and Dr. Guorong Wu of the Neuroscience Center at UNC-Chapel Hill. Dr. Stein will be talking about his work using Virtual Reality to map the mouse brain in 3D. The mouse brain has over 100 million nuclei, and current approaches that to mapping each nucleus, which involves combining 2D data, is slow and cumbersome. Dr. Wu will demo his lab’s work on visualizing the human brain network. They will present a 3D virtual reality (VR) environment to visualize the human brain connectome data for neuroscience and clinical application. Their VR environment provides a user-friendly interface and allows users to interact with the display of region-to-region connectivity in the whole brain. In addition, they integrate computational component of brain network analysis, multi-channel data fusion scenario, and a set of auxiliary functions into our VR environment. These features make their VR environment an efficient and innovative platform to analyze human brain connectome data. All are welcome." Zach Humphrey showing a fellow Tarheel our virtual reality system. Mapping the Mouse Brain in 3D using Virtual Reality a talk by Dr. Jason Stein and Dr. Guorong Wu of the Neuroscience Center at UNC-Chapel Hill for the AR/VR Interest Group meeting on June 28, 2018. Pictured here in central park on our way to lunch. We Welcome Rose Glass to Stein Lab! Rose Glass is a graduate student in the Biological and Biomedical Sciences Program in the Neuroscience Department at UNC-Chapel Hill. Welcome Rose! Congratulations to our undergraduate student Tianyi Liu for being awarded the Summer Undergraduate Research Fellowship (SURF) from UNC-Chapel Hill! Tianyi was selected by Honors Carolina to receive a William W. and Ida W. Taylor Honors Mentored Research Fellowship within SURF. The competition for this award was intense, 135 applications from a variety of fields were received and only 62 were awarded. Stein Lab and SURF are looking forward to seeing the results from the fellowship. Congratulations to Biomedical Engineering graduate student Oleh Krupa, who received a trainee travel award to attend the April 2018 BRAIN Initiative PI meeting in Washington, DC! Our paper was just published in Cell on the Dynamic Landscape of Open Chromatin during Human Neurogenesis. 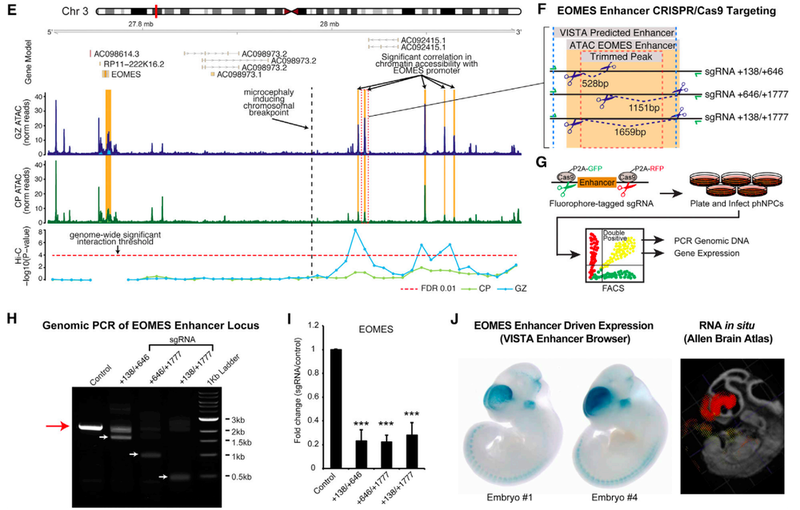 In this paper, we've mapped previously unknown regulatory elements to genes during human neurogenesis - including with genetically engineered validation of novel regulatory elements of EOMES and FGFR11, we identified some novel transcription factors that may be related to human neurogenesis, and finally we found that genetic variation within proliferation related regulatory elements impacts adult brain size and risk for neuropsychiatric diseases. The Committee on Faculty Research and Scholarly Leaves at UNC has awarded Jason a Junior Faculty Development Award! We welcome Brandon Le to Stein Lab! Brandon Le joined Stein lab in Fall 2017 to help facilitate high throughput human neural progenitor cell culture projects. Welcome Brandon! Congratulations to Mike Lafferty for receiving the Bioinformatics and Computational Biology NIH-supported training grant (T32 GM 067553)! Mike is a second year graduate student working on QTL analyses. You can find here all the slides from the Introduction to Imaging Genetics course at the Organization for Human Brain Mapping 2017 in Vancouver, Canada. A picture of all the faculty from the course is below.